We have a stock of new T-shirts (just delivered today) and are ready to go on sale. They came out very nice with our logo on the back and our name on the front left as pictured below. The short sleeve T shirts are Forest Green with white lettering and are 100% pre-shrunk cotton (Gildan brand). 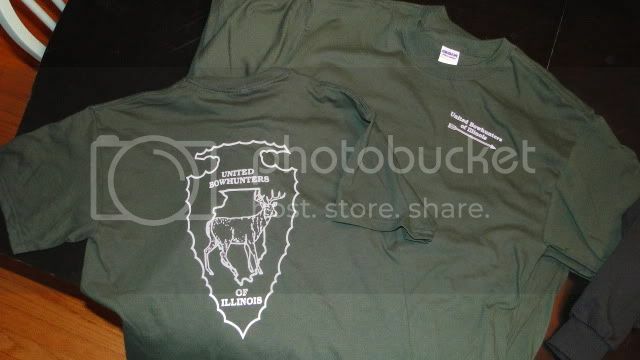 We also have several of the same Forest Green T-shirts with a front left pocket. The long sleeve shirts are exactly the same but Black in color (no pocket). The shirts cost $10 for a short sleeve and $12 for a long sleeve. I will be bringing the shirts with me to Springfield on August 21 (IDNR youth archery tent) thus if you would like to pick a shirt or two up then let me know or look me up at the tent. I have quite a few L & XL shirts as well as a few of the larger and smaller sizes (and can always order the size/color you need). Additionally we will try to have shirts available for sale at our events and of course we will have them at the annual banquet. 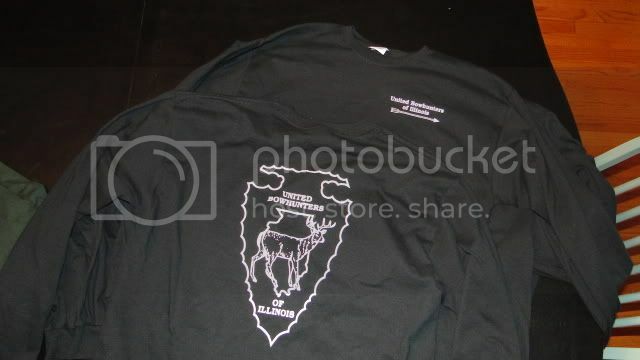 Its a great and fairly inexpensive way to promote our organization. Feel free to contact me if you have any further questions or would like to pick one up prior to the next time we meet. I just got mine and it is very nice.